In 2015 Liam’s Map was one of the most talented older horses in North America. This brilliant gray son of 1995 Breeders’ Cup Juvenile champion Unbridled’s Song was quick as they came out of the gate and pulled away from his competition in the stretch. He started just four times as a 4-year-old, but went out on top as a Breeders’ Cup Champion. Purchased for $800,000 at the 2012 Fasig-Tipton September Yearling Sale, Liam’s Map was trained by Todd Pletcher for Teresa Viola Racing Stables, Lane’s End Racing, and West Point Thoroughbreds. He was named after Special Forces U.S. Serviceman Liam Collins. Liam’s Map started the year by winning an optional claiming race at Belmont on June 19 with Javier Castellano aboard. Pletcher targeted the1 1/8 mile Whitney (G1) at Saratoga next. Ahead by more than four lengths in the stretch, Liam’s Map, now ridden by Mike Smith, could not hold off Honor Code at the wire and lost by a neck. Remaining at Saratoga, and reunited with jockey Javier Castellano, Liam’s Map returned less than a month later and scorched the field in the 1 1/8 mile Woodward by 4 ¾ lengths in a sharp 1:47.44. He would not start again until the Breeders’ Cup at Keeneland. 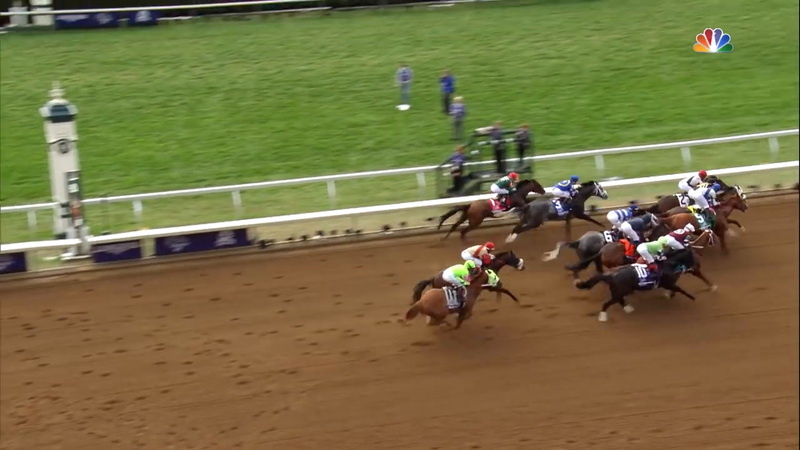 Liam’s Map was pre-entered by his connections in both the Breeders’ Cup Classic and the Breeders’ Cup Dirt Mile the day before. Early in Breeders’ Cup week the decision was made to start in the $1 million Las Vegas Dirt Mile on Breeders’ Cup Friday. Liam’s Map was the1-2 favorite in the Dirt Mile in an 11 horse field. Uncharacteristically, he broke slowly under Castellano and was back in fifth place and eager to get to the lead though the first six furlongs, Though still boxed in heading to the far turn, Castellano steadied his mount and found a path four lengths off the rail and set his sights on new front-runner Lea in the stretch. As if he shifted into overdrive, Liam’s Map surged past Lea for the lead and drove home 2 ½ lengths in front, and set a new track record, completing the mile in 1:34.54. "What was so impressive is that he recovered a couple times. He got steadied about the five-eighths pole and didn't have anywhere to go," Pletcher said. "But every time Javier had to tap on the brakes a little bit, you could see Liam's Map jump back into the bridle. I kept hoping. I kind of lost him at the five-sixteenths pole, but when I saw him turning for home I could see he had some momentum." Catellano concurred, adding “He showed a lot of patience. He waited behind horses and it was phenomenal. He showed great skill. He can run on the pace or off the pace. I had to fight a little to put him behind horses, but when he was in the clear, he exploded." Liam’s Map was retired to stud at Lane’s End Farm two days later, arriving by van with his Whitney nemesis Honor Code, who had finished third in the Breeders’ Cup Classic the day before. Ironically, in January of 2016, Honor Code defeated Liam’s Map in the vote for the Champion Older Dirt Male Eclipse Award.